MP Publishing Ltd, 9781849822305, 128pp. In her debut novel, Claudia White establishes an imaginative world that asks what if all the stories we were told as children were true, even just a little bit. By channeling a child’s sense of wonder to imagine what truths could be hidden in myths and legends, she provides a refreshingly intelligent tale that challenges our understanding of reality. The shape-shifting Athenites began cloaking themselves in secrecy centuries ago to avoid discrimination and persecution. Glimpses of the Athenites have led humans to create fairy tales and myths to explain the unexplainable. The story of Aesop’s Secret begins when Melinda and Felix Hutton learn that they belong to this ancient race. Their mother and father, Elaine and Jake, have dedicated their lives to proving that Athenites and humans once happily co-existed. Their hope is that, one day, their people with be able to live openly in human society. However, the charismatic and brilliant Professor Stumpworthy emerges as a challenger to these dreams of peace and unity. He has built his personal fortune through the secret use of his transformation abilities while eliminating any Athenite he deems a threat to his way of life. His former colleague, Joe Whiltshire, discovered artifacts that would help identify Athenites as valuable members of society, so Stumpworthy trapped him in the form of a rabbit named Aesop. When Felix becomes stricken by an unusual sickness while studying at the Stumpworthy School of Science in Paris, the family travels to be with him, unaware that they are Stumpworthy’s next targets. Now Joe, back in his human body, must aid Melinda in her attempt to save her family. 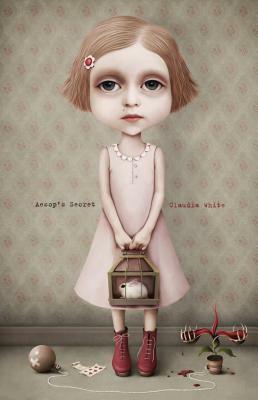 White’s narrative employs clever changes in points of view to fully develop the Hutton family and highlight the importance of unity and acceptance within a family, even if they belong in a fairy-tale. Claudia White wrote her three novels while living in Oxfordshire, England and Oakville, Ontario. A recognized expert in daydreaming, she has at last been prodded by her young audiences to record her imagined worlds on paper.